Subsidised milk for 5-11 year olds. We deal with the dairy. We deal directly with parents. Award-winning customer support – we’re winners of the LACA ‘Outstanding Supplier of the Year 2015’ award. FREE fridge on loan (conditions apply). FREE educational and promotional materials. We ensure the correct paperwork is kept for audit purposes. If you are a school and would like to join Cool Milk, please complete the below form and one of our team will contact you to help set up an account. Alternatively, please call us on 0800 056 2146. If you are a parent and would like to register your child for school milk, please click here. 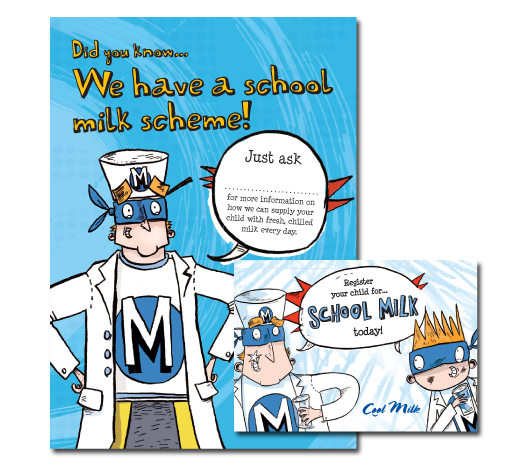 Raise the profile of your school milk scheme by using our promotional materials and educational resources. Our milk delivery has not arrived or is incorrect. What happens now? Milk deliveries will normally be made prior to 10.30am. In the event that your delivery has not arrived or is in any way incorrect, please contact us on the day at deliveries@coolmilk.com or alternatively please contact our Customer Service team on 0844 854 2913. We will then contact the dairy on your behalf and advise accordingly once we have received an update from them. In the event that the dairy fails to make a delivery, please confirm a non-delivery on your weekly delivery confirmation for that day and we will credit those customers affected. Alternatively please contact our Customer Service team on 0844 854 2913. Please bear in mind that at the start of a new term the deliveries could well be running later than you would normally expect. A parent has queried why their child has not received milk. What should I do? Please check your drinking list to see if the child is on the list. If they are not then ask the parent to contact us directly. My password/email address is wrong/not recognised when I try to log in to ‘My Account’ on the website. Why is this? Your username will be the Cool Milk account number that was given to you upon registration. Your username is generally your Cool Milk account number. You can reset your log in details by selecting the Forgot Password option. When this has been done you will receive a password reset email. If your email address has changed please contact our Customer Service team on 0844 854 2913. Why do I only receive deliveries on certain days/times of the week? The delivery patterns are set by the local dairy depot that delivers your milk, unfortunately these cannot be amended due to the way the milk round is structured. The weekly sheets you receive may show a daily order but it may be that enough milk is delivered on a particular day to cover all the subsequent days until your next delivery arrives. Don’t forget to rotate your milk so that you use the earliest delivered milk first. How can we let you know about a training day or school closure? In order to inform your dairyman, you need to add any closure days on your calendar via your online account with a minimum of 10 days in advance. However please do not forget that the parent payments are driven by your calendar dates and adding training days in late will cause issues with their payments. In the event of unexpected school closures, for example due to adverse weather conditions, we request that you let us know within 10 days of the closure to enable us to apply any appropriate credit to parent’s accounts. You can do this by emailing us at calendars@coolmilk.com. We haven’t received our weekly drinking list, what should we do? Your weekly list is available to download via your online account, once you have completed your weekly delivery confirmation. The confirmation email is sent to you on your last day of the week. Alternatively you can access the confirmation page via your online account, simply go online and select ‘Manage my Account’ to log in. How do we get our weekly list for the start of a new term? You can access your weekly list via your online account, simply go online and select ‘Manage my Account’ to log in and then select “View Drinking List” option, If you have any outstanding delivery confirmations you will be requested to confirm these first and then proceed to view drinking list. How can we make changes to our class lists? Please log in to your school’s account at www.coolmilk.com to make changes to class lists. Children moved into different classes will be reflected on your drinking list straight away – simply reprint your drinking list after changes are saved. If children who no longer require milk are moved into the ‘leavers’ class prior to 5pm on Tuesday, the changes will show on the following week’s drinking lists. Please remember to press Save to complete the changes. I have heard that schools receive a fridge from Cool Milk – how do we go about getting one ourselves? If you are a primary school then you will automatically receive a fridge when you join Cool Milk. If you are a Junior school and your order is for 20 or more children per day, you may qualify for a fridge. To request a fridge please email us on amend@coolmilk.com. We have received a different unit of measure than usual, why? Cool Milk endeavours to make sure that schools receive milk in their preferred unit of measure. However, in the occurrence of dairy shortages or production issues we will supply the school with a suitable alternative to ensure that there is no interruption in supply to children. How long should we keep our drinking lists, delivery notes and other correspondence? Paperwork should be kept for a minimum of three years for auditing purposes. How do we cancel the scheme? Please email us at cancel@coolmilk.com. How can I ensure that any children attending less than 5 days a week receive their milk? Simply log onto your account at www.coolmilk.com, select Manage Your Account, then Schools and log on using your User ID and password. Click on the “Part Time Attendees” button and put a cross (not attending) or a tick(attending) against each of the children where you want to amend their attendance days. Attendance day changes should be made to you online account by Tuesday 5pm to be effective for the following week. Why do I have to confirm my milk deliveries? Cool Milk submits claims on your behalf to the Department of Health’s Nursery Milk Reimbursement Unit (NMRU) for your under-fives and to the Rural Payments Agency (RPA) for your over-fives. The RPA requires us to obtain electronic delivery confirmation in order to satisfy the audit requirements of the European School Milk Scheme. Why do I have to confirm weekly? We believe by processing the confirmation weekly this will ensure greater accuracy of the information you are providing and the subsequent claim we make to the NMRU and payment of the milk to your milkman. How do I process my confirmation if I don’t have access to my email account or I’m unable to process the confirmation via the link in my email? Please visit https://customers.coolmilk.com, select “Manage My Account”, you will need your email address, Cool Milk customer number and Postcode, You will then be given various options and you should select View Drinking List. You will then be directed to the Delivery Confirmation page, where you are asked to confirm if you received the amount of milk we ordered. If you received a different amount you need to confirm this information. Please note the figures given are the number of children who we ordered milk for rather than you unit of measure. Will my milk continue if I don’t confirm my deliveries? Unfortunately due to this process being a mandatory requirement we will not be able to continue your milk supply without your confirmation details. Receiving your confirmation is the only way we can make a claim to the NMRU for the milk supplied and subsequently pay your milkman, which allows us to offer you our service. Why do I have to confirm the children attendance numbers on the NMRU website? In September 2016 the Department of Health made some changes to the Nursery Milk scheme. They now use your attendance data to validate the claims that we submit on your behalf for free milk for your under-fives. For further information please click here. What are the requirements of the new School Food Plan legislation? The legislation introduced on January 1st 2015 states that “Lower fat milk or lactose reduced milk must be available for drinking at least once per day, during school hours”. What does that mean for us as the school? You must make milk available for every child who wants it in primary schools, secondary schools, special schools and pupil referral units. Does the milk have to be free? As at present, all children aged between 5 and 18 who are eligible for free school meals (where the school claims a Pupil Premium) must be offered free milk. Schools may use the dedicated schools grant to fund the provision of milk for eligible pupils. From September 2014, when all infant pupils are entitled to a free school meal, milk must be offered free to infant pupils where it forms part of the school lunch. If milk is offered at any other time during the school day, it will only be free for those pupils with an underlying entitlement to free school meals. When should we make milk available? Milk should be made available during core school hours. In practice this means that milk can be made available at mid-morning break, mid-afternoon break or lunchtime. It is the school’s decision when to offer milk during the school day. By drinking milk at mid-morning or mid-afternoon break, children will benefit from the rehydration and energy boost halfway through the morning or afternoon. If you offer milk at lunchtime, it can be part of the school meal. We have not received our milk delivery, what should we do? Firstly check on our website front page to see if there are any notifications that affect your area. If your milk has not been received by 10:30am then please contact your dedicated Customer Service team either via email at deliveries@coolmilk.com or via telephone. If we have not already done so, we will contact the dairy in order to establish why delivery has not been made. We will ascertain the reason for the delay and notify you of the revised expected delivery time or alternatively, if the dairy is unable to complete the delivery to you we will inform you of this by return notification. What if the driver has told us that he cannot deliver the milk due to severe weather conditions? Unfortunately, there will be occasions when the dairy will not be able to fulfil a delivery due to severe weather conditions. On these occasions, no deliveries will take place and in the event of this affecting parents who pay for their child’s milk, they will be credited for those days that milk was not supplied. When completing your delivery confirmation please enter a zero quantity on the day no milk was received to ensure the correct claim is processed. We are closed due to severe weather, what do I do about cancelling our milk order? You must notify us as soon as possible by email at deliveries@coolmilk.com. We will attempt to contact the dairy to request deliveries be cancelled at your request. We will endeavour to meet with your request but cannot guarantee that we will be able to cancel the delivery, specifically on the day you notify us, due to the varying times dairymen complete their rounds, and the delivery could have already been made. However, if the dairy confirm they are able to cancel milk for the duration of your closure – any parents who pay for their child’s milk will be credited in full for the effected days you have given us notification of your closure. When completing your delivery confirmation please enter a zero quantity on your closure day. We have returned to our school after a period of closure and found milk outside, what do we do? You must notify us as soon as possible either via email at deliveries@coolmilk.com or via telephone. After ascertaining how long the milk has been outside, it is up to you to decide whether the milk is fit for consumption. If it is not, then you must dispose of the milk appropriately. Unfortunately we are unable to issue credits to paying parents as we were not notified of your closure and given an opportunity to cancel the delivery with the dairy.